COLUMBUS, Ohio (AP) — A wrongful-death lawsuit against an Ohio doctor accused of ordering potentially fatal doses of pain medication for hospital patients alleges a nurse now married to him administered one of the excessive doses he ordered in 2015. 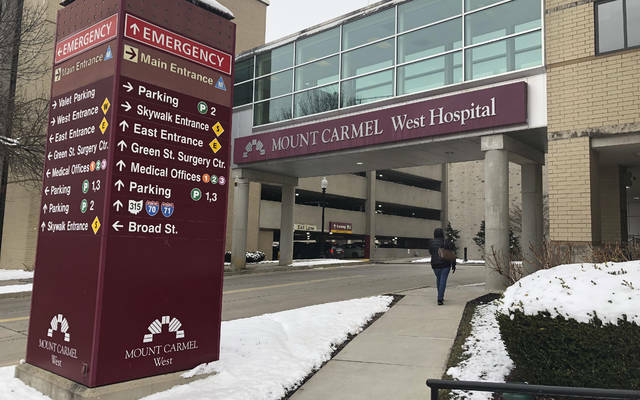 It’s among the growing list of at least a dozen cases brought since the Columbus-area Mount Carmel Health System found intensive care doctor William Husel ordered potentially fatal doses for at least 28 patients over several years, mostly at Mount Carmel West hospital. Some families are questioning whether drugs were wrongly used to hasten patients’ deaths intentionally or possibly illegally without their knowledge, and whether pharmacists and nurses ignored safeguards when approving and administering medication. Mount Carmel fired Husel in December, then publicly apologized and put 23 pharmacists, nurses and managers on leave pending investigation. It won’t say whether those employees include nurse Mariah Baird, who married Husel in October 2017 in North Carolina, according to marriage records. An updated lawsuit over the March 2015 death of 65-year-old Jan Thomas alleges Baird administered a lethal dose of fentanyl ordered by Husel. Attorney David Shroyer, who represents Thomas’ family, said that amended lawsuit was filed Tuesday. Lawyers for Husel, 43, haven’t commented. The State Medical Board suspended his license, but no criminal charges have been announced. Court records list no lawyer for Baird, and phone numbers associated with her weren’t accepting calls Tuesday. Also Tuesday, three new lawsuits were filed against Husel, the hospital, nurses and pharmacists over excessive dosages given to three patients, according to the office of attorney Gerry Leeseberg, who represents some of the families. Those new cases focus on the deaths of 55-year-old Timothy Fitzpatrick on Oct. 9, 2017; 70-year-old Larry Brigner on Dec. 10, 2017; and 39-year-old James “Nick” Timmons on Oct. 24. Leeseberg’s office said Fitzpatrick died within hours of another patient, 63-year-old Beverlee Schirtzinger, who also received an excessive dose ordered by Husel and provided by the same pharmacist and nurse as in Fitzpatrick’s case. No lawsuit has been filed over Schirtzinger’s death. Mount Carmel initially said affected patients were near death, but now says it’s investigating whether some received possibly lethal doses when there still might have been opportunity to improve their conditions with treatment. Local authorities are investigating, as is the Ohio Department of Health. The hospital also has been warned it could lose Medicare funding unless it proves it can correct deficiencies in its pharmaceutical services. REYNOLDSBURG, Ohio (Feb. 6, 2019) – Ohio Department of Agriculture (ODA) Director Dorothy Pelanda will host a series of informal meet and greet events across Ohio. The meetings will present the opportunity for Director Pelanda to introduce herself, share information regarding her background and listen to thoughts and ideas from members of Ohio’s food and agriculture industry. Jon Honeck, County Commissioners Association of Ohio (CCAO) senior policy analyst, testified before Gov. DeWine’s Advisory Committee on Transportation Infrastructure and discussed the challenges facing Ohio’s road transportation infrastructure. CAPA presents The Irish Tenors at the Ohio Theatre (39 E. State St.) on Sunday, March 10, at 7pm. Tickets are $23.50-$78.50 and can be purchased in-person at the CAPA Ticket Center (39 E. State St.), online at www.capa.com, or by phone at (614) 469-0939 or (800) 745-3000. Includes two acts and an intermission. Since they first joined voices in 1998, The Irish Tenors have proven themselves gifted interpreters of a wide range of material, with such songs as “My Heart Will Go On” (from Titanic), “Fairytale of New York”(previously recorded by Kirsty MacColl and The Pogues), and even Jimmy Kennedy’s “South of the Border” living comfortably alongside “Danny Boy,” “Whiskey in the Jar,” and “Fields of Athenry.” Among their best-selling albums, Heritage ranks as one of the finest with classic recordings of many of the most beautiful Irish songs. The Irish Tenors powerful vocal line-up of Finbar Wright, Anthony Kearns, and Ronan Tynan are unquestionably the leading brand of this genre. All classically trained singers, each having performed in leading concert halls across the world, together they combine to produce a sound and concert experience which touches hearts and stirs the emotions. They are surely versatile, but for many, the group is synonymous with Irish music. There is an aching, bittersweet quality to much of Ireland’s musical heritage, a melodic loveliness and emotional intensity. The dazzling technique and depth of feeling that defines this musical genre, amplified to the third power, is the hallmark of The Irish Tenors. The magic they’ve captured on previous releases has resulted in millions of albums sold and the upper reaches of Billboard’s music charts. The Irish Tenors have appeared on several incredibly successful and highly rated PBS specials including “Ellis Island” and “Live from Belfast” as well as “The Today Show,” “Good Morning America,” “Regis and Kelly,” “Martha Stewart,” A&E’s “Breakfast with the Arts,” and are one of the best-selling acts to appear on QVC. Heavy rain is expected to continue today and tomorrow. Motorists should never try to drive thru high water, it could be deeper than it looks. Turn around, don’t drown. COLUMBUS, OHIO (Feb. 6, 2019) – The Public Utilities Commission of Ohio (PUCO) today approved a system improvement charge for Aqua Ohio. Aqua will add a 3.66 percent surcharge to customer bills until the utility’s next distribution rate case with the PUCO. On March 1, 2018, Aqua Ohio filed an application with the PUCO for approval to collect a system improvement charge. In its application, Aqua stated it had made large infrastructure investments since it last received approval to increase its rates from the PUCO. The utility requested to establish a system improvement charge of 3.937 percent. COLUMBUS, OHIO (Feb. 6, 2019) – The Public Utilities Commission of Ohio (PUCO) today accepted the results of Dominion Energy Ohio’s auction for its standard service offer (SSO) and standard choice offer (SCO). The auction secured natural gas supplies for Dominion’s SSO/SCO customers for the period April 1, 2019 through March 31, 2020. The auction resulted in a retail price adjustment (RPA) of $0.22 per thousand cubic feet (Mcf). Dominion’s SSO/SCO rate changes monthly and will be calculated as the sum of the retail price adjustment, plus the New York Mercantile Exchange (NYMEX) month-end settlement price. The price adjustment reflects the winning bidders’ estimate of their cost to deliver natural gas from the production area to Dominion’s service area. The SCO applies to Dominion’s choice-eligible residential customers that have not selected an alternative supplier. Choice-eligible customers will continue to have the option to enroll with an energy choice supplier of their choosing, join a government aggregation group or choose the SCO. Customers who are interested in choosing an energy choice supplier can compare rate offers using the PUCO’s Energy Choice Ohio Apples to Apples comparison charts. Each SCO customer’s bill will indicate the certified retail natural gas supplier that is responsible for providing the customer’s natural gas. Customers who are already enrolled with an alternative supplier or a government aggregation group will not be affected by the change in the SCO rate; their contracts will remain the same. Customers who are enrolled in the Percentage of Income Payment Plan Plus or who are otherwise ineligible to participate in energy choice are served at the SSO rate, which is identical to the SCO rate. Dominion will continue to deliver natural gas to all customers, offer payment plans and respond to all emergency and customer service calls. On Feb. 5, 2019, a descending clock auction was held for the SSO/SCO rate. Bids were submitted by eight natural gas suppliers based on fixed adjustments to the NYMEX settlement price. The names of the four winning bidders will remain confidential for 15 days to protect the suppliers’ positions in contract negotiations with pipeline companies. A copy of today’s Commission finding and order is available at www.PUCO.ohio.gov. Click on the link to the Docketing Information System and enter the case number 19-119-GA-UNC. Habitat MidOhio began the new year by handing over the keys to a new home to our 500th family served! The deserving partner family that received the keys to their new home in early January is a family of ten. Mom works in early childhood care and dad works in the transportation industry. Like all Habitat homeowners, the family will assume a 0% interest mortgage on a home that scores among the highest in energy efficiency in the region. This energy efficiency translates into utilities savings of almost 50% per year (compared to similar-sized homes on the street). Reaching our 500th family served is a point of immense pride for our entire organization. Ours is a mission of empowerment. Our staff, volunteers, donors, partners, board and especially our partner families all relish & celebrate this exciting milestone. Helping to build the dream of homeownership through new home construction and home repairs in central Ohio has been an honor for our stakeholders and me, and is a true testament to the altruism and goodwill found central Ohio. We look forward to positively impacting the next 500 – within the next five years – and beyond! MidOhio ReStore is one of 13 social enterprises in central Ohio participating in a new social impact validation pilot program, spearheaded by SocialVentures, in partnership with the Better Business Bureau of Central Ohio, and in collaboration with Measurement Resources Company. This pilot program launched in January 2018 and will continue through June 2019. MidOhio ReStores opted to participate in this pilot program because we believe that it is critical for us to be transparent about how our ReStore business model serves as a platform for our organization’s impact towards social change. And it is important that our customers both understand and trust that the more successful we are financially, the more impact we can have on the communities we serve. We are pleased to promote this pilot program by displaying the Social Impact seal in our stores. What’s New at the ReStore? ReStore is celebrating the New Year by adding a new vendor! ReStore East now carries an additional brand of recycled latex paint, new 5-gallon buckets of deck stain, and quarts of polyurethane stains. VOLUNTEER OPPORTUNITIES: 2019 is going to bring a lot of volunteer opportunities with ReStore. Our next opportunity is at the Spring Home and Garden Show: February 16-23 at the Ohio Expo Center. This is weeklong show, and we will need volunteers to help out for the duration of the show. This show offers free entry to the event and a chance to win great raffle prizes! if you would like to help speak on Habitat for Humanity MidOhio ReStore’s behalf. Join Us On a Construction Site This Winter! The need for affordable housing doesn’t stop in the winter months, so neither do we! Habitat has a vast need for volunteers throughout the winter season. If you’re looking for a great team building activity for your company, congregation, or organization, or are looking for a way to get involved as an individual, join us on one of our build or home repair sites! What to expect: Our work week is Tuesday through Saturday from 8:30 a.m.-4:00 p.m. All tools, materials, and instructions will be provided; no previous experience needed. Volunteers must be at least 16 years old. Volunteers who brave the weather and volunteer on site between January 1 and March 31 will earn Winter Warriors gear! You will receive a long sleeve t-shirt your first time out on site, and from there you can earn more Winter Warriors gear the more you volunteer, including hats, travel mugs, sweatshirts, and more! For more information, please visit our volunteer website to sign up: https://volunteer.habitatmidohio.org or contact Rachel Hardin at rhardin@habitatmidohio.org or 614-364-7030. Habitat Young Professionals-MidOhio is hosting the 2nd Annual Hoops for Habitat fundraiser this April! Gather your team and join us for a 3-on-3 basketball tournament to support a great cause! Proceeds will go towards Habitat MidOhio’s first ever House that Beer Built project this summer.